In this lesson, you’re going to learn 59 positive personality adjectives in English. Check out 66 Negative Personality Adjectives here. There are lots of reasons why people like Nik. Affable — He’s easy to talk to. Agreeable — He’s enjoyable to talk to. Amiable — He’s friendly and nice. Charming — He has a “magic” effect that makes people like him. Polite — He’s good at saying “please,” “thank you,” etc. Likeable — He’s easy to like. Gregarious — He likes being with other people. Considerate — He always thinks about other people when he does something or talks to someone. Sympathetic* — He shows that he understands and cares about other people’s problems. Understanding — The same as “sympathetic” — he understands other people’s problems well. *Sympathetic is a false friend: in many languages, it means “nice,” but in English, it has a different meaning. Diplomatic — He is very good at trying to help people see both sides of a situation. Impartial — He doesn’t support just one side of a disagreement. Sincere — He says what he really thinks and feels. Straight-forward — He’s direct and honest. Generous — He likes giving things to people. Helpful — He likes helping. Kind — He cares about others and likes to help them, often emotionally. So that’s Nik. What an awesome guy! Observant — She’s good at noticing different things around her. Quick-witted — She can think quickly and intelligently. Patient — She can accept difficult situations without getting angry. Dynamic — She has a lot of energy and can think creatively. Bright — She’s smart and intelligent. Self-disciplined — She can control her own behaviour easily, and she’s organised. Resourceful — She’s good at finding ways to solve problems. Proactive — She doesn’t wait for things to happen. She makes them happen! Practical — She’s good at finding the simplest and most efficient solution. Organised — She knows how to organise things well. Efficient — She can organise things quickly and clearly. Hardworking — She works hard! Diligent — She does her work carefully and cares about the details. Versatile — She can do different things depending on the situation. Intuitive — She can understand what’s happening using her feelings (not just facts). Adaptable — She can change depending on the situation. Dependable — If she says she will do something, she will do it. Trustworthy — You can trust her to be honest and sincere. Loyal — She will always be on your side. So that’s Alexa. A great worker but not necessarily great fun. That’s why we need to have Freya in our lives! Freya — the fun lady! We all need a Freya in our lives. She’s the friend who makes us happy and who we can have fun with. She’s the friend who puts a smile on our faces and helps us kill the stress from our working day. Freya is fun to be around for several reasons. First of all, Freya has a lot of energy. When people have a lot of energy, this energy often transfers to you. It’s fun! Energetic — She has a lot of energy. Adventurous — She likes doing new and different things. Enthusiastic — She shows a lot of excitement and interest in things. Kooky — She’s a little crazy. But in a fun way. Cheerful — She’s always happy. Chatty — She loves talking and talks a lot. Convivial — She’s always in a good mood and is always friendly. Hilarious — She’s very, very, funny. Witty — She’s funny and can tell good jokes in an intelligent way. Humorous — She’s funny and entertaining. Amusing — She’s funny and fun. Non-judgemental — She won’t make you feel bad for something that you think, believe or do, even if it’s a mistake. Laid-back — She’s very relaxed about everything. Easy-going — This is the same as “laid-back” — it means “relaxed”! OK. So Freya’s good fun. But perhaps sometimes she can get annoying! There are times when we need to be serious. This is a good time to try to be like Delia. Delia is the person we know who will probably become successful. She knows what she wants in life, and she has the power to take it! She may not have so many friends, but she takes pleasure from her success. She has so much power in her. She’s an unstoppable force! Ambitious — She has very high targets for herself in life. Determined — She doesn’t quit, even when things get hard. Passionate — She believes in her work and her success on an emotional level. Persistent — She never gives up! Decisive — She can make a decision quickly and confidently. She’s also not afraid of anything. Or anyone! Fearless — She has no fear. Basically, she’s like a superhero! OK. So now you know 59 positive adjectives to describe people you like. Let’s take a look at a few different ways to use adjectives. There are different ways we can use this word to describe a person. But what if you don’t know this person? What if you just have the feeling that she might be funny? The first thing to ask yourself is this: What gives you this feeling? Is it about her appearance or just a general feeling? She looks like a funny person. Did you enjoy this lesson? If so, please help me out and share it! For even more adjectives to describe people, check out these 30 English Words, Phrases and Idioms for Crazy. How many adjectives! It’s a bit discouraging to have to remember all of them. Well, it’s not a complaint. I love your language. Yes. There are a lot of words in the language. But you don’t have to remember all of them. Every English speaker has their ‘favourite’ words. It’s a nice thing — it means that everyone speaks a little differently from each other. If you feel discouraged, just learn 2 from each category (they all have similar meanings) until you’re bored of using them! Then, go back and learn another 2. Thank you so much for made this site. Because it can help me a lot how to use the adjectives in a properly way in English language speaking. It is also a good lesson for English teachers to teach students how to use these adjectives. Thanks for the positive feedback Chhunheng! I know thanks so much! Some of these words i didnt even know! Thanks so much! ♡ I love You so much! I’m am using the words to describe my teachers in cards for chirstmas. Thank you so much it really helped! i like this site, student of ECC but a have problems with adjetives and nouns . this site is really helpfully. Great! I’m glad that you find this useful. Crazy adjectives huh? That sounds like a fun post. Maybe some time soon …. Thank you! It was very useful and interesting. You have made a good work. 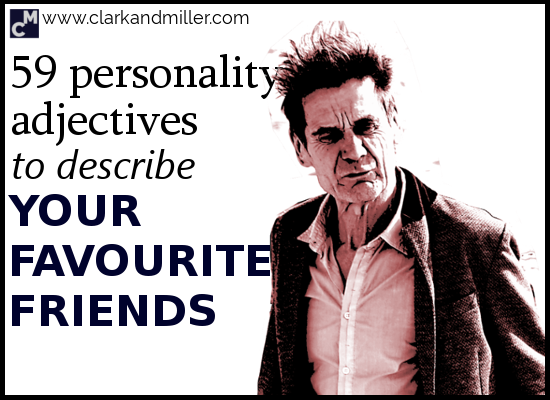 For me it was enough adjectives for describing good persons. Actually I don’t like meet baddies, however it may be good to know how to describe them. Good point. We’ll definitely do a “baddies” post some time in the future. I think it’ll be kind of fun! What a wonderful lesson! Thank you! I’ve enjoyed it so much! Useful and interesting! I do love it! Hi Tanya. Thanks for commenting. I’m really glad you found it useful. Remember: if there’s another topic you’d be interested to see on this blog, just tell me and we might write about it. Awesome! I love the small audios and the comparative graphics. Thank you very much! Can I found any other information regarding to this subject in different languages? Although we have a Turkish option on our website, our blog posts are only available in English. For now at least! what a considerate, sincere, and helpful person you are ???? Thanks Mutasim for being charming, straight-forward and humorous! I want more uncommon adjective words to describe a lady who is an educationist. Plz give me some more impressive adj words. Hmmm….. that’s a good question Debabrata. I’m not sure what you mean by “educationist.” Do you mean “educator” as a person, a teacher? Or do you mean someone who is well-educated? Some adjectives for someone who is smart and well-educated are knowledgeable, enlightened, erudite, refined, scholarly, intellectual, well-read, academic, studious, bookish, brainy, urbane. Keep in mind that although they all mean “well-educated,” each word has a different connotation (implied meaning or tone). For example, the word “brainy” implies someone who is a genius or obsessed with learning (affectionately known in slang as a “nerd” or “dork”), while the word, “refined” implies someone who has been educated in manners as well as educated academically. It is important to know the definition of each word in order to use it exactly as you mean it. I always keep a dictionary and a thesaurus side by side because there are so many words that I don’t know. I’m a native English speaker and I have a degree in English, but I still need to research words in order to choose the best ones! Our language is complex because so many other languages have influenced it through the centuries. You should write a blog, too! Add to my favorite site! It’s so helpful! Thanks a lot! Could you make a lesson about the most useful phrasel verbs? Also with audios. Words are powerful and empowering in character building. Thank you, Robert Elito. It’s easy to read and for ESL student like me, it’s very important. Thank you. As long as people like you benefit from these, I will certainly continue to make more! So glad to have chanced upon this . Yes! We never stop learning! Myself included. Thank you for the very, very kind words, Julie. Thank you, I appreciate your efforts. It’s come in handy for my report writing. Thanks for the positive feedback, Sally. These words are really very helpful when I’m wanting to describe someone. Thanks for the idea . Maybe sometime you can write some words that describe a Funny or sarcastic characters….. Thanks for the positive feedback, Tasneem! Hi clark I found it very useful n this reading made me capable in defining a personality. The aaproch is very interesting n attracting. Thanks for such a benificial work. Hope many more works with same sense further. I’m really glad you enjoyed the post and found it useful. OMG, This Website helped me sooooooooooooo much!!! I was able to effectively describe my friends. Thank you sooooooooooooooooo much Clark. You’ve got some positive friends!